Through the acquisition of CoreBiome - a microbiome analysis company focused on accelerating discovery for customers in medical, pharmaceutical, agricultural and academic research - DNA Genotek offers comprehensive services for microbiome sample processing, sequencing, and bioinformatic analysis. CoreBiome offers microbial profiling of all sample types, including the complete line of DNA Genotek’s OMNIgene® collection devices as well as a broad range of high, medium and low microbial biomass sample types. Affordable variable-depth shotgun metagenomics for large microbiome studies, providing species-level resolution and functional profiles. 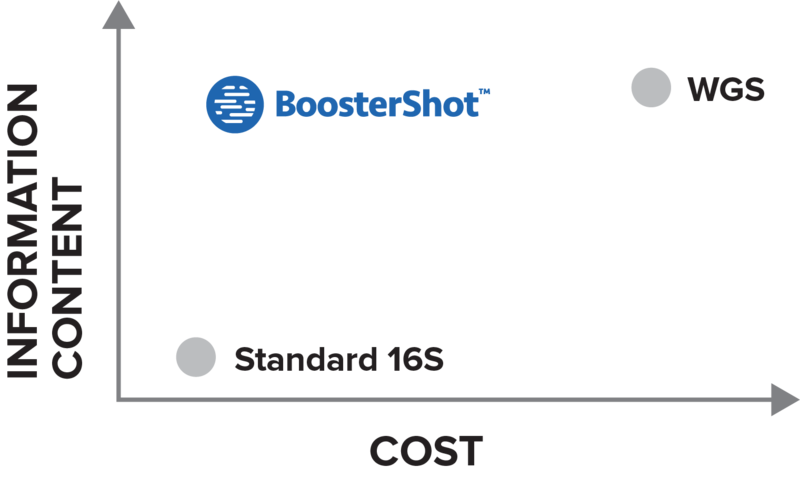 BoosterShot is our innovative alternative to amplicon sequencing for large-scale microbiome experimentation, starting at 2 million sequences per sample. BoosterShot uses shotgun sequencing to generate accurate taxonomic and functional profiles of the microbiome with species-level resolution. Based on algorithms of unparalleled sensitivity and proprietary genomics techniques, BoosterShot recovers the full species-level taxonomic and functional repertoire of a complex microbiome at dramatically lower cost than deep shotgun sequencing. BoosterShot achieves this performance by converting random DNA sequences into direct gene and species-level markers. BoosterShot is recommended for human stool and oral microbiomes, which are low in host DNA contamination, and which are well represented in whole-genome reference databases. It may still provide useful information that is complementary to 16S in other environments. Deliverables include raw sequencing data (FASTQ), Trimmed and stitched sequences (FASTA), taxonomy and function tables, quality-control dashboard, standard CorePlus analysis. Click here for an example report. 16S sequencing using improved protocols to detect more species and reduce bias over standard 16S methods for any environment. BenchMark is a 16S rRNA gene-based assay for microbiome profiling. 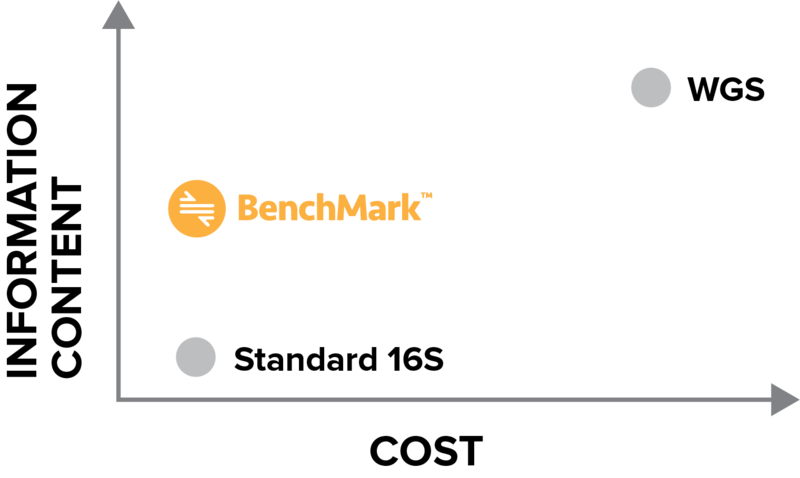 Based on University of Minnesota technology, BenchMark uses a combination of real-time PCR sample quantification, dual-indexed multiplexing, and optimized enzymatic and PCR conditions to eliminate most of the taxonomic dropout that is observed with “standard” 16S methods. BenchMark suppresses chimera formation and minimizes PCR error, resulting in greater accuracy when tested head-to-head against other 16S methods in the analysis of defined mock community standards. BenchMark is recommended for microbiome samples containing high host DNA contamination, or poor representation in whole-genome reference databases, such as those from soil, water, plants, or animals. Deliverables include raw sequencing data (FASTQ), Trimmed and stitched sequences (FASTA), taxonomy and predicted function tables, quality-control dashboard, standard CorePlus analysis. Click here for an example report (CorePlus analysis charged separately). High-throughput strain sequencing and comparative genomics. Characterize your entire strain bank faster than you can say "Sanger sequencing". 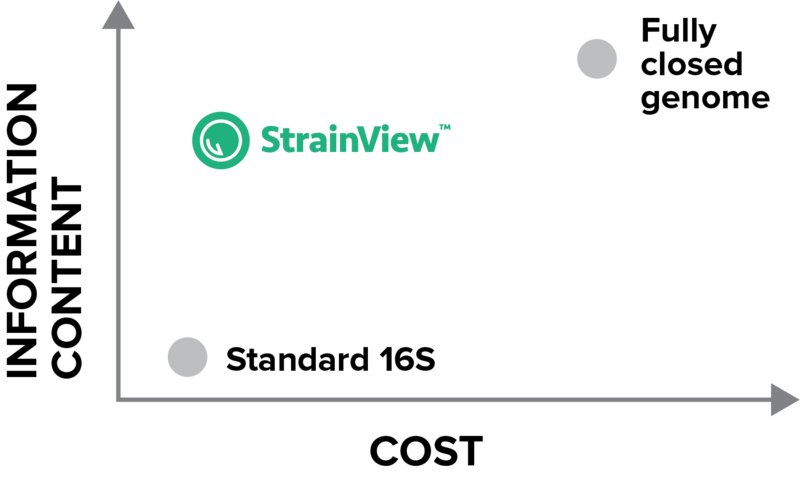 StrainView allows characterization of your entire strain bank with 99% coverage of novel genes and genomes. We combine our proprietary efficient library preparation protocols with optimal alignment-based database search to deliver genome assemblies for single-isolate samples and visualizations of shared genome content across your strains. Deliverables include raw sequencing data (FASTQ), Trimmed and stitched sequences (FASTA), taxonomy and annotated function tables, antibiotic resistance gene profiles, virulence gene profiles, quality-control dashboard, and standard data visualizations. Click here for an example report. Core Analysis provides customers with full primary data analysis and annotation, including closed-reference operational taxonomic unit (OTU) tables, genus-level taxonomy, species-level taxonomy where available, KEGG metabolic pathway and module tables predicted using the PICRUSt tool, beta diversity analyses (genus-level Bray-Curtis distances, OTU-level weighted and unweighted UniFrac distances), and alpha diversity analysis (Shannon, Simpson, Chao1, and whole-tree phylogenetic diversity). Customers also have access to raw demultiplexed sequencing data. CorePlus Analysis gives our customers full bioinformatics service for biomarker discovery and predictive modeling using statistics and machine learning. Our microbiome analysis experts work directly with customers to develop an analysis plan that meets the customers' scientific goals. Customers receive a custom report containing significant findings, differentiated biomarkers, and publication-ready data visualization figures. Services for research use only applications.